It's December 11, 2006, and Jane Loughman is holed up in the northern Washington home she shares with actor/director David Hewlett and canine co-star Mars. Another storm has passed, but this time they've only lost power for a couple of hours, a far cry from the three days of imposed darkness they suffered in the previous big storm. As close as they are to Vancouver, it's a bit of wilderness where they are: the price they pay for a view of the Pacific. 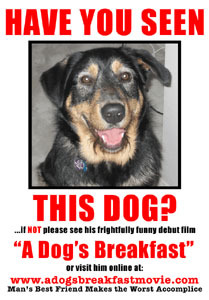 Jane has kindly agreed to chat with Solutions about the movie she produced and which David wrote, starred in, and directed, A Dog's Breakfast. The movie co-stars David's real-life little sister Kate Hewlett and friend and Atlantis co-star Paul McGillion. I had the good fortune of seeing the film and meeting many of those involved at its first screening in Los Angeles on November 16 (report). I loved every minute of the hilarious movie, and so was very anxious to explore it further with the woman behind it. Jane describes the LA screening as "terrifying, but really fun." "We knew from the incredible response on-line that it was going to be busy, that it was going to be fun. But the only other people we'd shown it to en masse were the cast and crew. And they loved it, but they knew what was coming, you know?" Potential distributors and industry insiders had seen it, but probably sitting at home or in their offices, sort of half watching it while they worked. They had reacted well after the fact, but nothing like the incredible fan response that night in the theater. "The screening was crazy! We were standing at the back saying, 'I can't believe it. They just missed that joke because they were still laughing at the last one!'" Laughter wasn't all they heard. Jane and David overheard a lady who noticed that David's character, Patrick, was wearing the same watch McKay wears on Atlantis. At that point, they knew they were surrounded by fans who know their stuff. Jane had thought people might notice the watch, but then they decided that Patrick likes gadgets even if he doesn't worry about updating his wardrobe. "We were on such a high seeing how well it went and how people responded to it, because it's a gamble — it's not sci fi. And while we know sci fi fans aren't only into sci fi, that's sort of the only common ground [for the crowd at the screening]." But, she noted, clearly those fans shared a good sense of humor, too. Jane very much enjoyed the Creation Stargate convention in nearby Burbank the weekend after the screening. She had attended others with David in England and in Australia, but this was their first in the US. She had such fun sitting on the stage next to David for the first appearance and Q&A session, because usually she is in the audience watching. "On the second day, when David and Kate did their panel, I was sitting there saying 'say this, say this!' trying to will him telepathically to say certain things… But he does fine on his own. That's my problem — he's too independent, too perfect," she laughs. She was appreciative of Creation being so flexible about David's appearance times and getting the word out about the screening. So all in all it was a great convention experience. MGM has announced they will distribute the film for home video, new media, and television. Asked what that means for a theatrical release, Jane said, "If enough people request a screening, then we can go to MGM and say, 'Look, people in Chicago really want to see this!' and they have conceded we are allowed to do theatrical 'events' screenings. It is extremely unlikely that, despite how popular they now realize it could be because of all the fantastic fan response, that they will ever do a theatrical release." The latter is sad news indeed for fans who would so enjoy seeing the film on the big screen and surrounded by a laughing audience. But Jane and David will look for more opportunities to show it to fans at screenings, scheduled for example around conventions like the one in Burbank. When they started the film, their aspirations were that it would be fantastic if they could release it on DVD, "even if we had to print them ourselves and sell them at lemonade stands," she laughs. They tried to keep their mindset small so that they didn't get ahead of themselves. "Now, we're so amazed and excited and overwhelmed that MGM has taken us on; we didn't think in our wildest dreams that would happen. And they're planning some really good stuff for us, so the fact that they're not taking us to theaters is ooooh-kay." The Stargate connection played a big part in MGM deciding to distribute the film, as one might expect given that MGM owns Stargate. The studio executive in charge of Stargate is Charles Cohen, a huge fan of Stargate who was ultimately a key player in the distribution deal. "We first met him when he came up to Vancouver, very excited that he was going to be an extra in 'Duet'… And he actually has a cameo in that episode. And this is the head of MGM!" "To have him backing us made a big impression on the people that work with him and for him. And certainly having him on your side is no bad thing," she continues. They gave him a copy of the film just for his own interest and to get his opinion. "And he came back and said, 'Not only do I like it, but I think we should do something with it.' 'You're in the family,' he said." She adds with a laugh, "So we're pushing him to make David a Bond baddie in the next Bond film." David expressed concern in an earlier interview that if he gave the movie to a Hollywood distributor, he'd never make enough money back to pay everyone who had worked on the film for "deferred wages." Asked how that issue stands now, Jane explained that David always does a lot of research on anything he does. "He'd read an awful lot of books about movie distribution where people had said, 'it's fantastic to have so-and-so distribute your film, but don't expect to ever see any money from it.' So we were very conscious that, while we're able to take the film to MGM, and having had it cost a certain amount, we do owe people big-time for all of their efforts. And we definitely wanted to make sure there was a chance we'd be able to pay people back, and I really think we will," she explains. "It may take a while, but it's going to happen." Asked what deferrals Mars is due, Jane explained, "Mars' agent really let him down on that one. He is only guaranteed a warm bed, lots of love, and shelter and food for as long as he wants to be with us. And that was the same deal he had before he became a movie star," she laughs. She assures they have done their best to keep Mars down-to-earth in spite of his stardom, although the day prior to our chat, Mars was involved in what they have dubbed the "cookie incident of '06." It so happens that Mars' girlfriend Lucy was visiting. She is (mostly) of the Leonberger breed, and her human is Kavan Smith, who plays Major Lorne on Atlantis. "We all left the room for a couple of minutes, and when we got back, we reached for a second helping of cookies with tea, and discovered that the munchkins had eaten them all! He and Lucy were very lazy the rest of the day. I'm not sure they felt very well. They'd eaten about 20 homemade ginger nutmeg Christmas cookies." Jane agreed it was Lucy who had been a bad influence on the usually well behaved and non-food-stealing Mars, but they love her anyway. Lucy was rescued from an animal shelter just as Mars was. Asked about how important fan response and on-line "buzz" was to their negotiations with MGM, Jane replied immediately, "Totally. One hundred percent. Charlie backing you goes a long way, but without being able to say, 'Twenty thousand people have viewed this thing on YouTube in a week;' And without being able to say, 'Look at these thousands of people who signed up for screenings. Look at how this website has taken off. And all these people who are launching their own marketing campaigns.' The squirrel marketing campaign is one of the single most impressive things that MGM have ever heard about. They 'get it' because obviously they've been doing Stargate for so long. But at the same time, I think nobody really understands the power of the fan support, for Stargate, for David, for this project. I think it's just incredible the way everyone's got behind us with the squirrel marketing. I get probably two or three emails a day from different people who say 'How about trying this for marketing? How about trying that?' And they're all genius ideas! And I just wish there was a hundred of me. And then I realize that there is — they're just out there on the web! I am the squirrel puppet master," she laughs. Jane acknowledges how unusual it is for an actor or director to implement his own website and forum the way David has, to break down the normal barrier between actor and fan. Asked if it might be a two-edged sword to be so accessible, Jane replies, "Only that he loves doing it so much, it could take up all of his time!" David is also a defacto computer consultant on set, with the other actors asking him questions on the level of, "What does this button do?" Jane loves the Macintosh platform just as David does and says they would like to pitch Apple and tell them they created the movie completely on Apple computers. "The notes were written on an Apple, the script was written on an Apple, the scheduling, the budgeting, the shoot sheets were all done on an Apple. Then the editing was done on an Apple, right down to editing the trailers." They used the professional software Avid for the movie editing, but Final Cut Pro for the trailers, which is Apple's consumer editing software. As far as whether the movie might be sold on iTunes, Jane says enthusiastically, "That would be really, really cool. I think we'd love that… It's kind of in MGM's hands now, and I believe that that may be something that they're looking into because they know their stuff." Since Stargate is already distributed on iTunes, Jane agrees it would be a natural strategy. Then there is the question of timing, and which comes first, DVD or iTunes. Those issues all are yet to be resolved. As those who have heard her lovely voice might guess, Jane hails from London, England. She grew up literally in the theater — her dad ran one in the famous West End district. She studied film at university, then got offered a job in TV. She produced a British program called "Movies, Games, and Videos," a weekly show about new releases in those three genres. They covered the computer game and film industries. The company that produced that program sent her to LA to produce an LA-based version. From there she went to "E," the cable entertainment channel, and helped to produce "E News" for a number of years. She enjoyed it for a while, then yearned for something more. "I always felt like 'I'm talking about the entertainment industry, but I want to be making the product, not making the product out of the product.'" By then she had met and begun dating David in LA. When he got the call to go to Vancouver to be in Atlantis, she was free-lancing in LA. After six months of traveling back and forth to visit him, she said, "I'm sorry, honey, I want to be where you are," and moved up to Vancouver. She and David had talked for years about making a film together. So, with Jane on hand in Vancouver, they decided she would produce whatever they made. He had been working on scripts all along. "We worked our way through a couple of low-budget ideas and each time got progressively more low-budget," she laughs. Then they came up with A Dog's Breakfast which they figured they could make look like a million bucks without costing that much. "Then we went to John Lenic from Stargate: SG-1 and said, okay, 'Okay, we've got the brains, well some of them, I guess, and the script and the enthusiasm. Want to come on board and try and make this happen?' And he was amazing." Lenic brought in all the equipment and crews. David and Jane both knew most of them pretty well, but it was something different to ask them to give up their free time to stand in the rain and shoot a movie, and they are forever grateful for it. "They were just amazing. The crew was incredible. Even the ones who started out going 'Oh, it's raining and it's January, and I'd really like to be earning some money' came back day after day and got more and more enthusiastic, and by the end of it were so keen and happy for us and excited about the whole thing." As to why, in addition to just wanting to work with David and company, making a film is different from making a TV show, and the crew was excited by the idea of being able to spend more time getting it right. But, she continues, "There were days when we just had to get shots. And the DOP [director of photography] would say, 'but we're making a movie!' and David would reply with, 'today we're just getting the shots. Tomorrow, we'll do the art.'" Asked how she ever got the idea to cast Chris Judge as a man who has no luck dating, she says, "Well it was the most preposterous idea I could possibly think! Chris and I have been friends since before Stargate began." They met in LA before Chris was cast for Stargate. And in an odd twist of fate, Jane was there at the SG-1 premiere party before Season 1 began on Showtime. That's a story she loves to use to astound the current MGM executives. Anyway, as far as casting Chris, "We were trying to figure out who to cast— whether to look for somebody who was your archetypal loser, who couldn't get a date. We were just throwing out crazy ideas of who could possibly play it, and I think I suggested Chris because he's a really great guy and a great actor, and I thought it'd be really fun to work with him." David wondered if Chris would really do it, but they asked him, and he agreed. They'd written a small role for him out of concern for taking too much of his time, but when he came and did the table reading, he was so brilliant they wrote him an entire new scene. So Jane is very happy to take credit for the idea to cast Chris. "Mars was a great companion," she continues. "He sat under my feet in video village at all times. Unless he was required on set, of course. So he would get a quick brush-down and go on. The dog-handling part was really very easy." Everyone wanted to play with Mars, who was happy to oblige. Mars fell in love with the director of photography, Jim Menard of Stargate fame, who kept cookies in his shirt front pocket to reward Mars for a job well done. "Mars now, every time he sees him, he looks at him and then just stares down the pocket." As Jane was speaking, a thumping began in the background. That was Mars, who had heard himself being discussed and had come to ask what was going on by wagging his tail. In her dual producer/girlfriend role, each night at home, Jane helped David review the day's shots and figure out the next day's. On set, she had to make sure David had enough food, enough cups of tea, and enough moments to just breathe and not stress about the next shot or the next line. "I was his eyes. He would be in the scene, and I would be the one looking at it, going 'Is that how you wanted that to look?'" Jane recalls. She did this from video village, which was inside the house, in the small dining room between the living room and the kitchen. It is never shown on screen, of course, because it was full of equipment and people. The house was very small for the size of the production, and they used the back bedrooms for wardrobe, hair and make-up, and props for the decor. They had to move equipment constantly into whatever rooms weren't being used. But video village never moved. "We were perhaps the cushiest people in the whole shoot," Jane says, recalling herself, Heather the script coordinator and Jim Menard sitting around an $80,000 monitor, laughing their heads off, Mars at their feet. As far as Jane's memories of each actor, she is happy to relate, "Paul is hilarious and lovely and sweet, and the biggest flirt on the planet." Paul, David, and Jane have had a rapport for a long time, and that made it easy. "We'd just been to Australia together to do Best of Both Worlds [a convention] in the November. So, we had a whole unspoken language, I guess, of joking around. So, he was fabulous." "Kate… she and I have gotten over the whole 'big brother's girlfriend' thing years ago. She's just the best actress and just so perfect and charming and sweet and lovely and prepared and professional and amazing. She's just wonderful. Bless her; she was a real fish out of water. She didn't know the crew, she didn't know everybody like we did, and yet she came in and charmed the pants off everyone, including Chris Judge. David was completely disconcerted that his blind date scene had turned into a flirty-flirty thing," she says, chuckling. In any case, the humor on set was amazing as was everyone's patience with the weather and other hardships. She agrees it was a once in a lifetime experience. Jane has spent quite a bit of time on set at the Atlantis production. Obviously it is of a much grander scale than A Dog's Breakfast set had been, with a lot more money and a lot more riding on it. "The Atlantis set is fabulous and fun. I got really to be at home there in Season 1, because I was commuting up from LA every possible opportunity to come see David. And I would do my work in his trailer, then go hang out on set for a bit, then go back to the trailer. I would do the reverse of him. Like when he got called to set, I would go with him, and I would go and hang out and take a break from my job. But then, when he was off set, he'd come hang out in the trailer and I'd be like 'Shhh! I've got to work, I've got to write!'" Jane recalls, laughing. She got to know everyone in Season 1, and that made the collaboration for the movie that much easier. As David mentioned at the convention, Jane really did stand in for Amanda Tapping during filming of "Grace Under Pressure." The plan was that when Amanda had to go off set to take care of her baby, they would film David's "side" of the scene from over Jane's shoulder. Jane's job would be to say Carter's lines so David could act in response to them. But, it didn't go as planned, as Jane explains. "I was the biggest loser! I thought that I knew all of those lines. I had run them with David so many times! And they said, well, 'Jane knows those lines. When Amanda's got to go take a break and feed the baby, why don't you (Jane) get in the tank in the wetsuit and be there for David to do the reverse shots?' So all I had to do was just spout Amanda's lines at David. And they started rolling, and David said his line, and I looked at him and completely blanked and said 'I haven't got a clue what I'm doing!'" Jane laughs. "And Martin Wood ended up having to read my lines while David looked at me with my jaw dropped, and I mouthed words that didn't make any sense. I was the most worthless stand-in ever! And then I was so mad at myself— but everyone forgave me. It's for David, really, that I don't have any aspirations to be an actress," she chuckles. She reads the scripts with David often at home to help him memorize his many lines. "During the season, most of our conversations are interspersed in between running lines. David will say one of his lines about energy power sources and blah blah blah and imminent shut-down and panic, and I'll do a silly voice to portray whoever it is that's speaking next. Like I'll do a terrible American drawl to be Joe or I'll be terribly serious but calm to be Rachel, and I'll drop my voice really deep to be Jason. And then I'll say, 'Oh yeah, did I tell you so-and-so called today?' and then we'll have a mini conversation about that, and David will say the next line again," she says. As far as whether he'll have less technobabble to memorize next year with Amanda on the show part time, she answers, "That's the thing, they're going to split the smarts, but somehow I think it will still be rapid-fire with lots of comebacks. Heaven forbid I'm ever in the situation of having to stand in for Amanda again!" Asked about the news of the upcoming death or disappearance of Carson Beckett from Atlantis, played by her friend Paul McGillion, Jane could only say, "I think it's very sad for Paul and for the show." Finally, as to whether David ever exhibits any of Rodney McKay's more outrageous character traits, Jane exclaims, just a bit too brightly, "No, never, how on Earth would you possibly think so? He's a brilliant, fabulous actor, and if he's drawing on reality I've never seen it." But in truth, "He comes home and has to decompress from a day of being McKay. We've always said he gets fifteen minutes of McKay, and then he's back to David." As to how much he really is like McKay, Jane reports, "He has the smarts to draw on, and the courage, but I think he really has to work at the panic. The 'snarcasm' he has down. He's British born, you know." With that we wrapped up our conversation. It was truly a delight to chat with Jane; she is brimming with laughter and humor, and Solutions is ever grateful she took time away from A Dog's Breakfast and her holiday preparations to chat with us. © Michelle and Stargate SG-1 Solutions. All photos by Michelle.